Wolfram Alpha allows you to solve most any math problem and even graphs the answer. With the free version, it will allow you to see 2 problems worked out step by step daily. Using the free version, you can have any number of problems answered daily, just no work shown. For students, the cost of unlimited problems shown with all of the steps shown is less than $5/month. Otherwise, it runs about $10/month for non-students who want the steps shown for unlimited problems daily. This site is amazing as it graphs all the solutions. But, like a lot of math-centric sites and tools, it will still give some answers that are unhelpful, usually when dealing with logs, natural logs, and complex expressions. Also, it might take time to become familiar with how to render a question so it answers your question in a satisfactory manner. For example, instead of rad 2, you will want to render it as square root of 2. Or, when raising 2 to the third power, render it as 2^3. 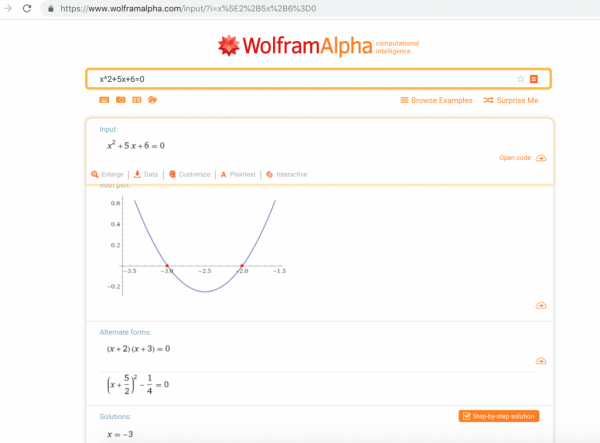 Once you get the hang of it and start to understand its potential, you will likely want to use Wolfram Alpha quite often and possibly pay for the pro/student version. It’s likely the best option for higher level math students. Beautiful, Free Math. That is quite an apt description for Desmos. You can enter your equation and it graphs it for you instantly. It’s similar to the TI-84 graphing calculator, but much easier to use and much faster to adjust the viewing screen. In another blog post I’ll describe using Desmos in greater detail, but for now just realize it can graph equations, even trig equations. Also, it will provide you with intercepts, maximums, minimums, and points of intersection with other graphs. Oh, and from a table, it can furnish you with a line of best fit (linear regression line/curve) along with the equation and R^2 value (Correlation Coefficient). You can even share Desmos with a collaborator so you guys can view the same graph simultaneously. 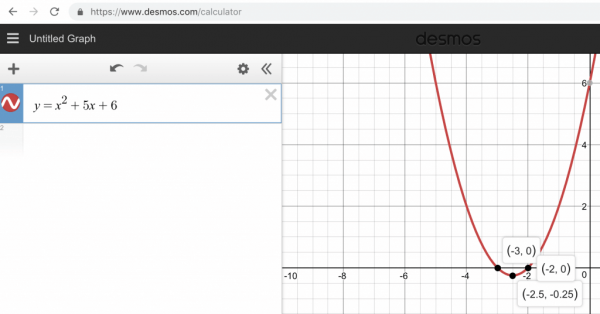 Of the free online math resources, Desmos is probably the best for graphing. 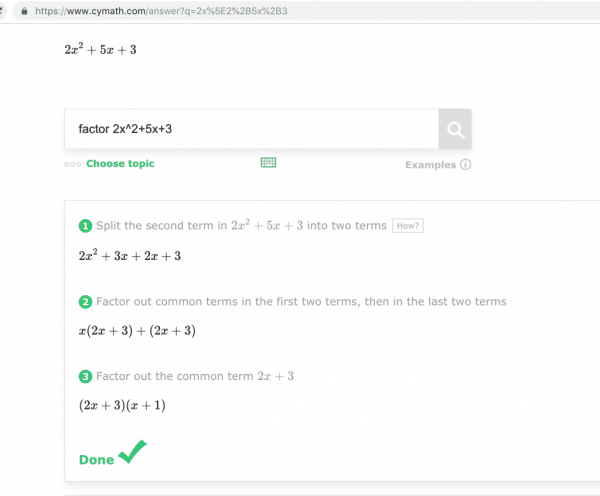 Cymath is another math equation solver. It’s great as it shows you the work step by step, even annotating what is done each step. For math classes up to and including precalculus, this is a great resource. And, it’s completely free. The only downside is an ad showing near the top of the viewing screen. 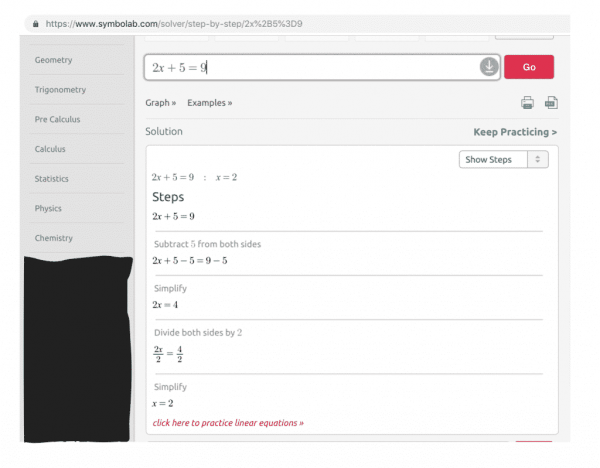 Similar to Cymath, Symbolab is a math equation solver. Symbolab also shows you each step, describing what to do to get to the next step. An advantage of symbolab is that it provides some of the funky symbols of math (think absolute value bars, logs, radicals, derivatives, integrals, etc.) that are difficult to render otherwise. The only disadvantage I’ve encountered with symbolab is that it has multiple ads placed in different sections of your screen, so it looks a little spammy, if not distracting. Despite the ads on the page, symbolab is probably the best equation solver of the free online math resources. Many of you in high school or college are already familiar with mathway through their phone app. Just like the phone app, mathway.com will solve your math problems for you. Their site has an interface similar to symbolab, yet easier to use and without ads. 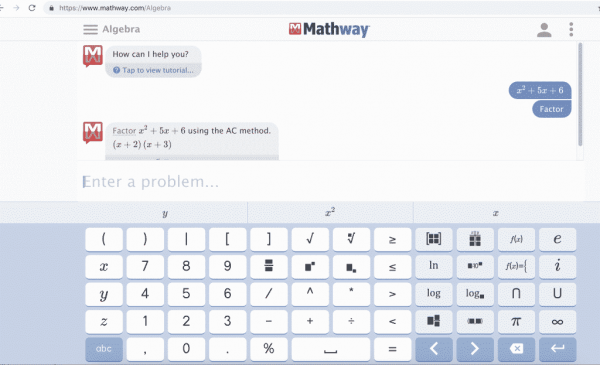 However, unlike symbolab and cymath, mathway will ask you to join in order to see the step-by-step work of a problem. Those are the best free online math resources I’ve encountered. If there are any more that you’ve found useful or aspects I’ve missed regarding the aforementioned resources, please let me know. If you want more help, please contact me or set up a session. Thanks.